A state police tactical team helps re-arrest Rafael Santiago-Salazar, 19, in Machias. 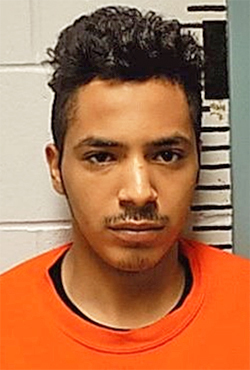 The Maine Drug Enforcement Agency on Tuesday said it re-arrested an 19-year-old Connecticut man who jumped bail in February after being charged with trafficking heroin and crack cocaine. Rafael Santiago-Salazar, of Waterbury, Conn., was arrested in February on one felony count of drug trafficking. After posting $1,500 bail, Santiago-Salazar never showed up for his court dates in Maine, MDEA said in a statement. Agents recently learned that Santiago-Salazar had returned to Washington County, was likely staying at a home at 63 Center St. in Machias and was facing charges in Connecticut of attempted murder, felony assault, carrying a pistol without a permit and unlawful restraint. The Maine State Police tactical team assisted in Santiago-Salazar’s arrested Monday night at the Center Street apartment. Santiago-Salazar fled out a back door, but was quickly apprehended. Two other men in the house, Ted MacArthur, 27 of Machias, and Jonathan Johnson, 34, were also arrested on outstanding warrants.